Esta foi a minha primeira Sling Bag, e eu gostei bastante do resultado... A S. gostou do padrão da minha primeira mala, mas comentou comigo que gostava que desse para por a tiracolo e que devia de ter um fecho (neste caso optei por um botão magnético). Fiz-lhe esta surpresa e ela gostou! Fiquei contente!!! 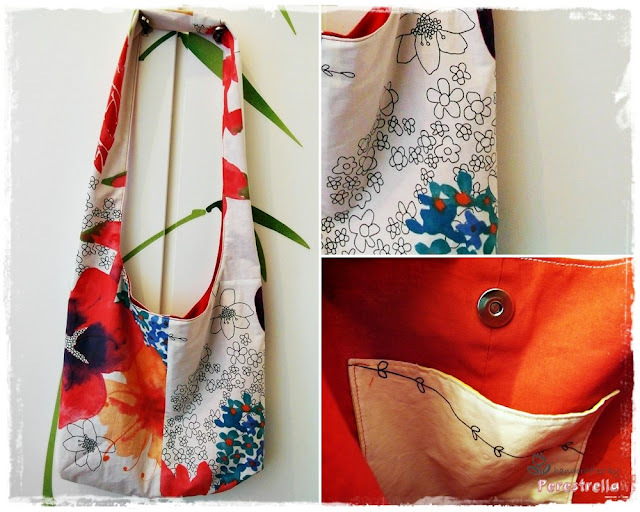 This was my first Sling Bag, and I was quite happy with the result... S. liked the pattern of my first bag but she told me that she preferred to have a shoulder strap and that it should have some type of lock (in this case I opted for a magnetic snap). I made her this surprise and she enjoyed it! I was glad!! !